Cru Systems is an expert manufacturer and distributor of Gravity Fill Bottling Machines as well as providers of entire bottling line solutions. Our products allow you to rapidly and professionally fill your Wine, Beer and Spirits bottles - achieving the exact same fill height each and every time. In addition to our professional-grade bottlers, Cru is also proud to provide our customers with the latest in bottling line technologies, including labelers, corkers, cappers and any other items you will need to bottle your product. Our Gravity Fill Bottling Machines are incredibly dependable, very simple to operate and since they are gravity fed, there are no electrical worries. Also, with few moving parts, you can rely on easy bottling and low maintenance for years to come. 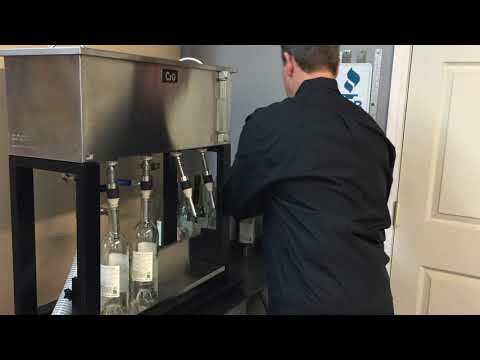 The Cru Systems’ Gravity Fill Bottling Machine is a complete, portable, bottle filler for the Wine, Beer and Spirits industries. This is the perfect system for small to medium size bottling runs - which makes it optimal for wineries, distilleries, breweries, or even the avid home bottling entrepreneur. You will be amazed at how easy it is to bottle with Cru Systems bottling equipment. From the moment we set-up your system and teach you how truly simple they are to operate, you will wonder what took you to so long to bottle on your own! Cru Systems has over 25 years of experience in mechanical design, with an emphasis on customization and solid customer service. We have built a reputation of consistently exceeding our client’s expectations. We began our career in manufacturing bottling equipment as we didn’t see a good alternative to the high-cost of automated bottling lines or the expense and inconvenience of using outside facilities or bottling trucks. We also noticed that there was a need for local service and support of the products. We truly believe that Cru Systems has filled these needs. In addition to engineering custom bottlers, we also offer a complete array of bottling products to provide you with an entire bottling solution. Whether you need a filler, a corker, or an entire bottling line, let us configure a set-up for you. Our aim is to provide you with professional bottling equipment, designed to keep your bottling expenses to a minimum. Whatever your volume and needs, we can make it happen for you. Filling at 800+ Bottles per Hour! Cru System's Garage Start-Up Continues to Grow! When we at Cru Systems began building American-Made Gravity Fill Bottling Machines in our garage in Napa, California, it was because we felt there was a need in the marketplace that wasn’t truly being met. Many people start off bottling by using funnels, hoses and plastic equipment to handle the filling. Others may rely on trucks or outside facilities. We wanted to provide people with the option of owning their own Bottling Equipment and actually working with the manufacturer directly that built the machine. From there, we began growing organically. When our customers needed something that we didn’t produce ourselves, we began investigating to find the exact solution they needed. Since that time, we have spent thousands of hours researching the bottling industry, trends in the marketplace as well as equipment throughout the world. We have visited other manufacturing facilities and of course, made many mistakes along the way! During this time, we began assembling an amazing partner network – one that would allow us to offer entire bottling solutions to our customers, relying on our years of experience, research and of course lessons learned by trial and error. We worked tirelessly to find manufacturers that were as relentless about quality as we were at Cru Systems. They had to abide by the strict guidelines and professional standards that we held true to in every unit we manufactured. This has obviously been a very long process but one that has brought us great success as we assembled our Partner Network. In trying to expand our bottling offerings to our customers, we never lost sight of offering professional-grade products, first and foremost. We also have stayed true to our mantra, no matter how cliché it may sound, of ALWAYS being there for our clients! We are proud to back up all products we sell, to always be a source of information and help with all bottling needs in any way necessary. Today we are pleased to provide our clients complete Modular Bottling Systems. Whether they need one product or they want us to configure an entire bottling line, we are able to make that happen. Although Silicon Valley is known for amazing start-ups (Hewlett Packard, anyone? ), we are proud that our garage start-up happened right here in the Carneros region of beautiful Napa Valley! Cru Systems, which started out manufacturing Gravity Fill Bottling Machines in Napa, has now expanded to include a complete modular offering to its customers. "We realized that our clients were frustrated doing all of the research and configuration themselves", said Steve McGarvey, President of Cru Systems. "We wanted to offer them a full modular line, utilizing our years of research experience in the industry, so they could concentrate on doing what they do best, make wine". Cru Systems has continued to add to its line of modular products, allowing customers to create the exact semi-automatic bottling line that works for them. Today, you can work with Cru Systems to purchase not only a semi-automatic, gravity fill bottler, but also add components that complete your specific bottling system. These modular items can be purchased separately to augment a current line or as an all-inclusive modular solution that is configured from scratch. Items currently offered include Spargers/Rinsers, Fillers, Corkers and Cappers, Labelers as well as several other sundry items in the bottling process. Cru Systems not only builds quality items in Napa, but is also very selective in partnering with superior manufacturers across the world that meet their standards and come with the highest in customer ratings. "We've done the painstaking research in the field for our clients", added Steve. "Therefore, our folks can feel good knowing that they are getting the highest quality machines at the best prices for their small to medium size bottling runs". Cru Systems Announces Italian Partnership! Cru Systems is excited to have just finalized a partnership with an incredible company in Northern Italy. Now, in addition to our custom US made fillers, we will be distributing for this amazing company that has been in the wine industry for nearly 100 years. This collaboration allows us to expand on our product line so that we can now provide full bottling solutions for our customers! Looking very forward to working with this 4th generation family-owned business – Ciao for now!